I have found a bug. I can not see seconds after boot. See Attach File. Hi djdanby. 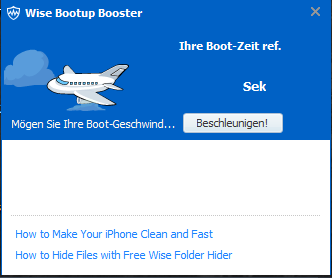 That has been solved by WiseCleaner Team in the next version (3.9.4). Dramatically increase the status of Defrag module, update its GUI appearance and func. and speed! it looks very ugly on that moment, now. How would you compare Wise Care 365 versus Glarysoft Glary Utilities? I value program's Registry Cleaning module. Hi, any chance to add a service manager/editor and the ability to apply profiles to enabled/disable various services at once like in advanced uninstaller? Thanks in advance for any reply, best regards. 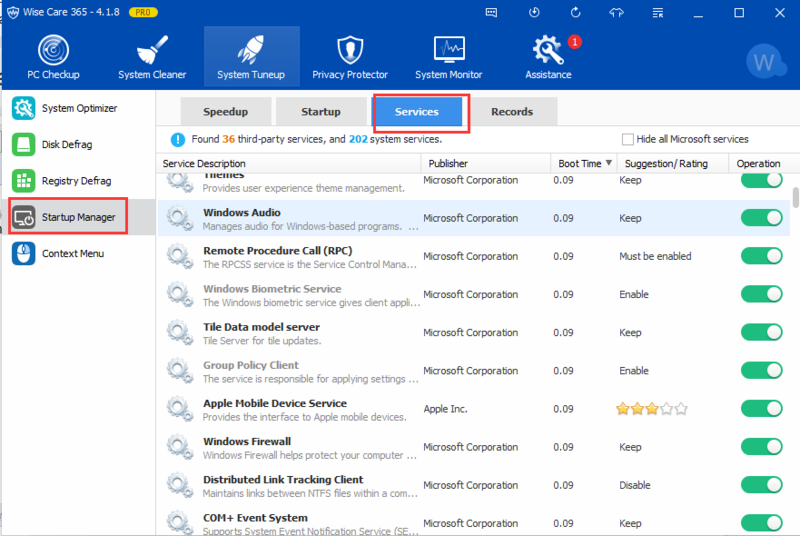 Actually, wise care 365 has already included services manager, you can see it in System Tuneup -> Startup manager. Thanks but it's like the one the comes with windows, I mean there is no option to save or apply profiles. "I mean there is no option to save or apply profiles"? Sorry, I can't understand it. Can you tell me more details? I think he probably wants something like profiles in windows xp... Removed in windows vista onwards. An user could create more profiles, with different services configurations (see blackviper.com). I never used vista, so I really can't tell, but I was talking about enable/disable various services at one and save that configuration as a profile so in case of a clean os installation or similar scenarios you can enable/disable those services by applying the profile you previously saved. Its really handy and it saves time. You can see this function in programs like advanced uninstaller where you have predefined profiles (minimal, safe, gamer) and also can create your own profiles, also there are apps that are exclusively dedicated to "optimize" services like "easy service optimizer" and "kickstart", in these cases the profiles are only predefined by the authors if I remember well, you can check them, both are free and portable. Thanks for your suggestion, I will send it to developer team. And another problem with Version 4.23. This message popup at irregular intervals. And although my PC has been around for hours. 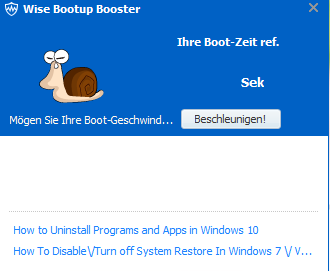 Does Wise boot booster appear at irregular intervals? 3, Right clik the file and select Proteries - Details, then tell me the File version. These two files are latest. It can't display the boot time only once? or every time you start PC? Every time I have never seen a Number. 1, When you use previous version (4.21, 4.19, or earlier), does it display the time? 2, What is your system, Win 10/8/7/vista/xp, 32 bit or 64 bit? I just want to bring again to your attention the old problem with the slimming system function on windows 7 OSs. When using the slimming system, some files will be marked as missing/deleted/corrupt by MS SFC tool (sfc /scannow). Hence the guys that help to fix SFC problems will put a bad reputation on your programs (all of your programs, the entire company).